Radio Flyer ride on toys are gaining popularity again and looking to regain their place as the ride-on toys that make memories for young kids and their parents. Most of them are more of a throwback than a vintage ride-on, as they have been made in recent years with the classic 1950’s and 1960’s styling, similar to what you would expect to see in an automobile during the same timeframe. If you are considering such a foot powered toy for your child, one of these options just might be right for you. The Radio Flyer ride on toy lineup is generally foot to ground powered; there are no foot pedals and no motor on most of the models. This helps to keep the speeds slow for improved safety for very young children. Most are probably best for toddlers, as they are small enough to fit into it and big enough to understand how to propel themselves around on it across the floor, garage, driveway, or sidewalk. The only negative to something like this, is the limited control and possibility of injury if the child happens to start coasting down a steep hill. Just use caution and be aware of this to avoid the potential safety hazard. For what it’s worth, the suggested age on this model is 10 months and older for most of their ride on toys. Pricing is all over the place. Most are right around one hundred dollars, but some are substantially less. If you are willing to go used, you can find them on sites like Craigslist and eBay for under 30 dollars. It is really up to you if you are willing to buy a used model or if you simply must have on that’s brand new and in the box. There have been tons of different options made over the years. Many of the retro models are still being made today, while some of the vintage models have not been made for many years. 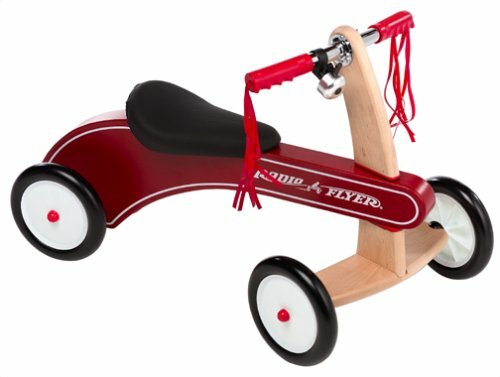 Radio Flyer Little Red Roadster: It is foot to ground powered and made for very young children. It looks like….a little red roadster. With steel wheels and rubber tires, it is well made and should last for multiple children, unlike many of the all plastic alternatives you’ll find out there today. Red Sport Coupe: Unlike many of the other ride on toys featured in this article, this one has a handle on the back that parents can use to hold onto and control the speed of the unit as they walk behind. This one is a little more expensive, often costing 125 to 150 dollars, but it also comes with lights and sounds dashboard, clicking keys, and a honking horn. You will find them for sale at various places, including retail stores, Amazon, and eBay. Various Scooters: Over the years, there have been many retro and vintage Radio Flyer scooters made. Some of them have two wheels, some three or four, and at least one classic model had five. If you are looking to buy a classic antique, you will find several of them for sale. If you want something new, they are still being made in various forms. This is one of the best and most popular examples of ride on toys you will ever be able to find. Radio Flyer Classic Tiny Trike: Unlike most tricycles, this one has four wheels, presumably for added stability. In true retro fashion, this one is made of wood, making it a good example of classic Americana in design and construction. You will find it for sale for under 70 dollars from many different sellers. It has a bell on the handlebars and tassels hanging from the ends of the handgrips. It will take you back quite a few decades when you look at it; it truly has a retro feel to it. The Scoot About: It is very similar to the classic tiny trike and has four wheels. Made for children one year old and older, it can be purchased for very young kids as their first ride on toy. It comes with the old style classic ringing bell on the handlebars, and has tassels hanging from the hand grips for that retro look and feel. This one also has a furniture friendly bumper, making it a good option for indoor use by very young toddlers. Little Red Fire Engine: The all steel body makes this on much more durable than many of the others. This one has a handle for parents on the back for pushing or controlling, so the young child doesn’t coast down a hill and get injured. This is a nice safety feature that could be important to you and your child. These are relatively inexpensive and can be purchased at many different stores, including those online. 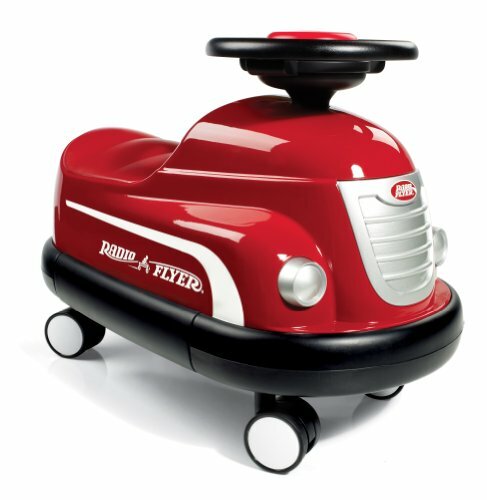 Radio Flyer Classic Bumper Car: Made for kids 1-3 years old, this one is priced under 50 dollars at most sellers, making it one of the cheap options you will find if you want to go brand new. It has retro styling and a honking horn. When it crashes into something, like a real bumper car would, it makes crashing noises, a feature most young kids will really like and enjoy. Slider Rider: This one is kind of like a big wheel, but the back wheels are very small and pivot, making it capable of super sharp turns and donuts. The frame is made of steel and the suggested ages for this model are 2-5 years. This one is a little different than other Radio Flyer ride on toys as it can be adjusted to fit your child as he or she grows. 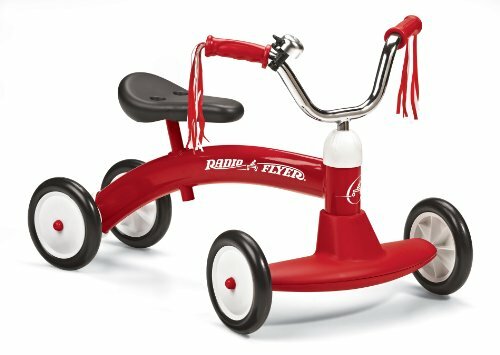 This is more of a modern toy than a retro or vintage one, but since it’s made by Radio Flyer, it is made with quality materials and craftsmanship and should last for many years to come. It is just one of many different vintage Radio Flyer ride on toys.